My first impression of Dublin was of the strange smell, something of a cross between old food and stale cigar smoke. As we ambled about in our first hour in the fair city, we noticed the additional bouquet of foetid seawater and burnt rubber, which didn’t help my first impression of the centre as being surprisingly dull and a little squalid. However, matters improved somewhat as we wandered into Temple Bar and popped into The Quay for cabbage and mash and a big slab of bacon, washed down with my first ever pint of real (ie Dublin) Guinness. Mmmmm… the hype is all true. Guinness tastes much, much better in its home town than anywhere else, much lighter in texture and with a more delicate flavour with a hint of cream. Very nice. On, then, to Madigans, a beautiful gin palace, for copious Guinness and amusing conversation, before staggering over the street to the hotel, in which we were woken early in the morning by the merry sounds of a couple of drunks duetting in Gaelic as they stumbled down the road. Later that morning we took the tourist bus tour. Bronwyn and I have, independently over the years, formed an attachment to tourist bus tours, especially of the ride-all-day-around-the-city open-top running-commentary variety. There’s something strangely satisfying about sitting in the freezing wet, huddled over a squawking loudspeaker, and trying to figure out which of the million visible objects the (probably synthetic) guide is talking about. This particular bus took us on an interesting circuit of the Georgian and Mediaeval districts on a suitably cloudy day. The history presented by the scratchy voice was a jumble of revolutions and battles, not particularly pro- or anti-English but just a continuous roil of revolution and counter-revolution. For me, at least, this higgledy piggledy history was brought into sharp relief by the hundreds of placards bearing the face – but not the name – of Gerry Adams, currently it seems a respectable politician, but years ago when I was growing up in London he was the face of terrorism, appearing smirking on the news every time an IRA bomb killed another crowd of innocent Londoners. It was explained to me in a bar that, in the current election campaign, each party was only allowed to advertise with so many placards for their candidate, but that the Sinn Fein had so much money that they’d decided to put up hundreds of apolitical posters instead, bearing only an instantly recognisable face but no overt election statement. We left the bus to buy some postcards and some stamps. Outside the Dublin Post Office is a monument to the millennium, an incredible metal needle soaring heavenward, impossible to capture on film, one of those objects that has to be experienced in the flesh. Most Dubliners seem to hate it, and take great pleasure in pointing out that their millennium statue wasn’t finished until 2003. However, it is the Georgian facade of the General Post Office itself that really grabs your attention. 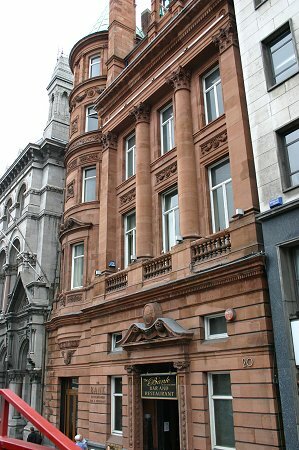 The Dublin GPO became a symbol of the 1916 Easter Rising when members of the Irish Volunteers and Irish Citizen Army seized the building on Easter Monday, and Patrick Pearse read out the Proclamation of the Irish republic from its steps. The rebels remained inside for almost a week, but shelling from the British eventually forced them out. Inside the post office is a set of stunning oil paintings depicting the event. From one piece of history to another: The next tourist bus dropped us outside the somewhat forbidding walls of the Guinness Brewery. Inside, it has been converted to a bit of a tourist shrine to advertising, although with enough tongue in cheek and enough real historical content that we didn’t mind too much. Our entry ticket was a drop of Guinness forever sealed in a perspex paperweight… you get the idea. And then, perched on high up a tower over the brewery, you can sup a pint of (sadly, overly chilled) Guinness straight from the source while enjoying an unrivalled view of the stainless steel industrial stout towers and, er, the rest of Dublin. This entry was posted in Europe, Ireland, Travel and tagged Beer on 2004/06/21 by Reinhard.